The best compact excavators loaders! Bobcat compact excavators deliver more hydraulic horsepower than other brands of the same size. More power means more performance under load. This performance advantage is easily measured in increased slew torque, faster cycle times and maximum auxiliary hydraulic performance. The end result is more work per hour in the toughest conditions and increased attachment performance. Choose the arm configuration that best meets your needs. The standard power arm offers maximum arm breakout force. For added reach and dig depth, equip your machine with the optional long arm (select models). The first and only clamp-ready extendable arm option (select models) delivers power and lifting performance when it’s retracted, combined with additional reach and dig depth when it’s extended. If you need more reach from your compact excavator, the extendable-arm option may be just what you need. As needed, the arm can be hydraulically extended up to 30 in., and then retracted to its standard position for maximum arm force and lift performance. The extendable arm cylinder is powered by the primary auxiliary circuit, and a paddle on the right-hand joystick controls the extension and retraction of the arm. Auto Idle makes it easier – and quieter – to pause your work, take a quick break or communicate on the jobsite. You’ll save fuel too. When machine functions aren’t used for more than four seconds, the machine automatically idles the engine until work resumes. When you move the joystick controls or initiate travel, the excavator automatically returns to the previously set throttle position. Auto idle can be enabled or disabled as needed. Auto-Shift travel shifts the machine out of high range and back automatically, offering superb travel performance without having to manually downshift. It automatically transitions the travel motors to and from high range, giving you greater tractive effort with no manual shifting. Simply select the travel speed range and go. A directional lug track also provides a smoother ride and less vibration when traveling. Bobcat® excavator controls allow you to make fine movements with low effort and maximum comfort – so you can get precise results in less time, with less fatigue. A rocker-style thumb switch, located on the left joystick, provides superior boom swing control with better metering than foot pedals. Multifunction operation, such as swinging and traveling simultaneously, is also easier. With the boom swing control on the joystick, you get more floor space and foot room that provides a comfort advantage on long, tiring jobs. Squeeze through the tightest workspaces by retracting the track on the Bobcat® 418 and E20 compact excavators. The hydraulically activated retractable undercarriage is ideal for access through gates and doorways. No tools are needed for adjusting the blade extensions on the 418 and E20. Easily remove the blade extensions and store directly on the blade structure. Easily change between “excavator” and “backhoe” patterns. No keys are required. Bobcat® compact excavators deliver the house, boom, arm and bucket control you expect in the most challenging work environments. It’s the confidence in these precise movements that determines whether you complete the job using your machine, or with two workers and a pair of shovels. This predictable control is delivered through exclusive control valve systems and torque-limiting piston pumps that match force with demand. For the most convenient attachment changes in the industry, choose the optional Hydraulic X-ChangeTM system. Activate the hydraulic pins at the press of a switch; retract for attachment removal or extend for attachment hook up. Hydraulic X-Change maintains optimal “pin-on” bucket geometry so arm and bucket forces are not compromised. Many Bobcat® compact excavators are equipped with selectable auxiliary hydraulics. Three flow rates help you optimize the response of hydraulic attachments such as PowerTilt® and Hydra-Tilt™ swing accessories, clamps, grapples, hydraulic breakers and auger attachments. Select low flow for precise control, medium flow for placing or handling materials, or maximum flow for peak hydraulic attachment performance. Achieve an accurate grade every time without leaving your cab by using the Bobcat® depth check system. Efficient and easy to use, the system delivers accurate dig depth measurement for precision grading performance. It prevents overdigging and the costs associated with backfilling and compacting fill material. It also prevents underdigging and the resulting need for manual labor to finalize depth or grade. Compared to their minimal or zero tail swing counterparts, conventional tail swing models typically deliver the greatest lift capacity in the Bobcat® lineup. Conventional tail swing excavators also have a narrower stance (width) for improved access through doorways, gates, property lines or other restrictions. It’s also helpful when you load the machine on a trailer. Maneuver faster with the Bobcat two-speed option. The quicker you can move on your jobsite, the faster you can complete your work. Select low range for pushing and dozing and high range for increased jobsite mobility. Pass underneath branches, low openings and through doorways to get to your work area. Available only on the Bobcat 418 excavator. Keep your Bobcat® compact excavator on the job – and out of the shop – with smart diagnostic features. Machine Shutdown Protection Most Bobcat excavators come standard with automatic shutdown that tracks engine coolant temperature, engine oil pressure, hydraulic oil temperature and other functions. The system prevents catastrophic engine failure and shuts the machine down if necessary – lessening the chance of damage to the engine or hydraulic components. Diagnostics Bobcat provides on-board diagnostics to efficiently troubleshoot problems in the field or prevent them before they occur – reducing downtime for you. Cold Weather Engine Protection This feature protects your machine from working too hard before the engine is properly warmed up. Evaluate your machine performance, assess your costs and protect your investment with the handy instrumentation options on Bobcat® compact excavators. The standard panel gives you essential data, while the optional deluxe instrumentation panel offers advanced capabilities. Bobcat® compact excavators are designed to prevent problems before they occur. Electronics meet or exceed military requirements for sealing, moisture, shock and vibration. Automatic glow plugs deliver easier starts and longer starter life, while battery run-down protection protects against vandals or forgetful operators. Keys are no longer necessary with the optional keyless start on Bobcat® compact excavators. The simple option ensures no time is lost on your worksite if you or your employees forget the keys in the shop. Start your machine by simply entering a set code number and pressing the start button. Keyless start also protects against theft or unauthorized use. The code can easily be changed using the master code supplied with the kit. It’s especially useful for rental machines, as the code can be changed for each customer. Steel tracks increase your uptime and pushing force when you’re working in harsh or abrasive jobsites. The segmented construction makes for quick, convenient repair – and the rubber pads give you a more comfortable ride. Extend the life of your backfill blade through the bolt-on, one-piece and reversible cutting edge. The Bobcat® angle blade is easily replaceable compared to welded-on cutting edges. An audible alarm beeps faster as the fuel tank approaches its capacity, taking the guesswork out of refueling. Bobcat® compact excavators are engineered to operate in the smallest of workspaces. All models feature the exclusive In-Track Swing Frame, which allows you to get closer to your work. The swing castings and cylinders stay within the tracks when you dig in an offset position. Exposed hoses, weaker components and inferior design may mean a trip to the shop when you need your machine the most. All Bobcat® compact excavators are equipped with a durable tailgate, protected hydraulic lines, smarter hose routing and a redesigned workgroup. Do you frequently work close to objects, or against a wall? On minimal tail swing models, the rear of the house protrudes as much as 6 inches beyond the width of the tracks. For the greatest flexibility, choose a zero tail swing model; the rear of the house stays within the width of the tracks through full rotation. Slew and deposit soil where you need it, reposition the machine fewer times, and worry less about inadvertently contacting any surrounding objects. The cooling cores can be separated for quick, easy cleaning of the radiator. Integrated slew brakes hold your load steady on slopes for more accurate placement. It’s easier to position the excavator, and you no longer need to manually engage the slew brake during transport. Vital machine components on the Bobcat® 418 and E20 are protected from damage. The hydraulic cylinder is mounted on top of the boom to prevent contact with the trench, bucket or nearby obstacles. Save time and remain productive longer with 250-hour greasing intervals on the E63 and E85. Extended intervals are possible through the polymer shims and bushing design. Get on and off the jobsite faster. Secure your load quickly, without searching for hard-to-reach tie-downs. You’ll be more attentive when your compact excavator is quieter, set to your preferred temperature, and easy to operate. M-Series models continue the Bobcat tradition of comfortable, operator-focused machines. Enjoy more cab space, advanced climate control and reduced noise levels. A pattern selector allows you to change from an “excavator” to a “backhoe” control pattern. No keys or special tools are required. Make throttle adjustments with an easy-to-use rotary knob. It provides precise control and adjusts easier than a lever. 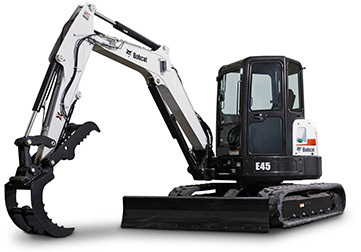 The hydraulic joystick control on the Bobcat® excavator delivers smooth, fluid operation and increased efficiency. Operator-friendly, ergonomic controls keep you productive all day long. Control attachments with precision, flexibility and low fatigue. Grade, level and backfill with less operator input. Head to the next jobsite using the one-hand travel control. Adjust the arm rests for added comfort. The Bobcat® 418 allows you to position the joysticks outward for comfort, or inward for access through narrow openings. Bobcat excavators feature soft-grip pilot control joysticks that provide effortless control of the workgroup. With Bobcat® compact excavators, it’s easy to make maintenance part of your routine. Perform preventative maintenance using Bobcat’s industry-leading service access and simple checkpoints. Use your shop time to complete the job instead of gaining access. You’ll complete essential maintenance as scheduled and reduce your operating costs. A centralized grease bank makes fast, simple work of lubricating the slew bearing and slew pinion. With the large opening, it’s simple and easy to reach the well-protected grease cylinder fitting and complete track tensioning. Select models have 250-hour greasing intervals, thanks to polymer shims and the design of the bushings at the boom, arm and bucket locations. Train operators and technicians in the safe operating and servicing of Bobcat® equipment. Operator training courses, safety videos and other training materials are available at your Bobcat dealer’s parts department or by visiting the training resources. With Bobcat® compact excavators, you’re ready to expand your offerings and work beyond your traditional digging projects. Choose from more than a dozen attachments. Easily add a hydraulic clamp. Use the standard auxiliary quick couplers. Share many attachments with your Bobcat loader. The exclusive X-ChangeTM quick-tach mounting system (available on most models) provides multi-attachment capabilities. The mounting system maintains arm-to-bucket geometry for top breakout force. The system features two pins that engage hooks on your attachment, saving time and headaches when during attachment changes. It also simplifies loading and unloading buckets or attachments on a trailer. The design makes it easy to use the right attachment for the job at hand. As an alternative to a clamp attachment, the Pro Clamp System consists of a base component, standard pin-on work tool and optional grading tool. Grab large, small or irregular objects with greater confidence. Create a smooth trench bottom and clean up spoil piles quickly. Pins retract to remove the attachment and extend to secure the attachment. Ergonomic controls are precise, intuitive and flexible. Choose from three auxiliary hydraulic flow settings for your application.